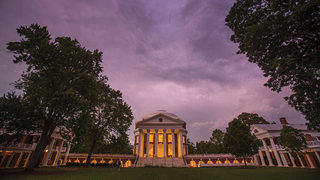 The classically styled Rotunda is the focal point of Thomas Jefferson's Academical Village. Thomas Jefferson designed the University of Virginia’s Academical Village to fit his vision for learning as a lifelong and shared experience. Set around an expansive lawn, the village (now part of a UNESCO World Heritage Site) included classrooms, dining facilities, and housing. The centerpiece, though, was the dome-topped library. Known as the Rotunda, it was still under construction when Jefferson died in 1826. After a fire ravaged much of the building in 1895, the interior was redesigned by McKim, Mead and White, and numerous changes and restoration efforts followed—the latest of which was completed this past August. With UVA’s extensive archives and building documents to guide them, crews replaced the Dome Room’s plaster capitals with wooden replicas of the original carved column detailing. In the north and south porticos, the restoration team replaced the clockworks and the marble column capitals. They also repaired the leaking roof and exterior brick and updated the electrical and plumbing systems. New classrooms, multipurpose spaces, and study areas ensure the Rotunda’s future functionality. “Our main goal was to respect the many layers of history in the building,” says Jody Lahendro, the university’s historic preservation architect.